before a golden city skyline. Measures 2 1/2" wide and 1" high. 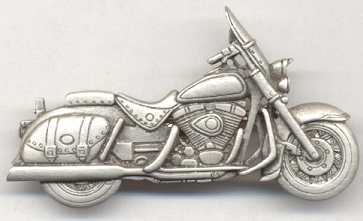 Very nicely detailed motorcycle pin in pewter. Slightly over 2 1/4 inches in width and 1 1/4 inch in height. Closes with a safety clasp, Signed JJ. Made in the USA. Safe travels! This brass tac pin measures approximately 1/2 inch tall and 1 1/2 inches long. Signed JJ and made in the USA. Closes with a push back.